Sometimes things find me. I went to a flea market today. 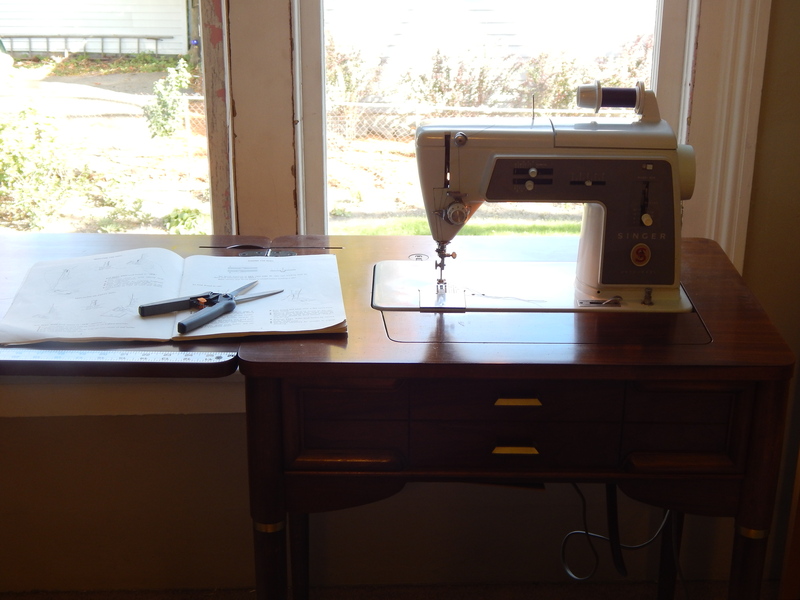 I was looking for an old door ( I want an old wooden door to replace an ugly steel door) I came home with a sewing machine. I couldn’t pass it up, it called out to me “take me home”. It is a singer 600 , from 1965 (the year I was born) , and it came with a great cabinet and the original manual. It seems to be functional but I might still take it in to have a tune up. If you look at the window frames behind the machine you can see the paint looks pretty bad. I had to take them apart and do a lot of work to get them to open and close properly and replace a cracked window . Sanding next and then painting. 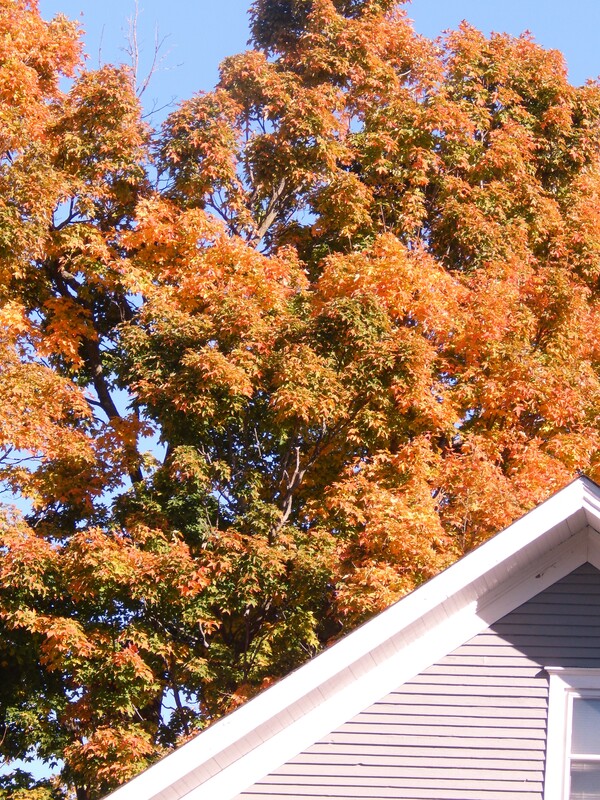 The trees in the neighborhood are changing. This is one I can see outside the studio window. Teddy had been very concerned about all the squirrels. he is always on patrol to chase them out of the yard. Don’t let that scowl fool you 🙂 here he is last night while I was quilting. Curled up and comfy under his bandanna quilt. 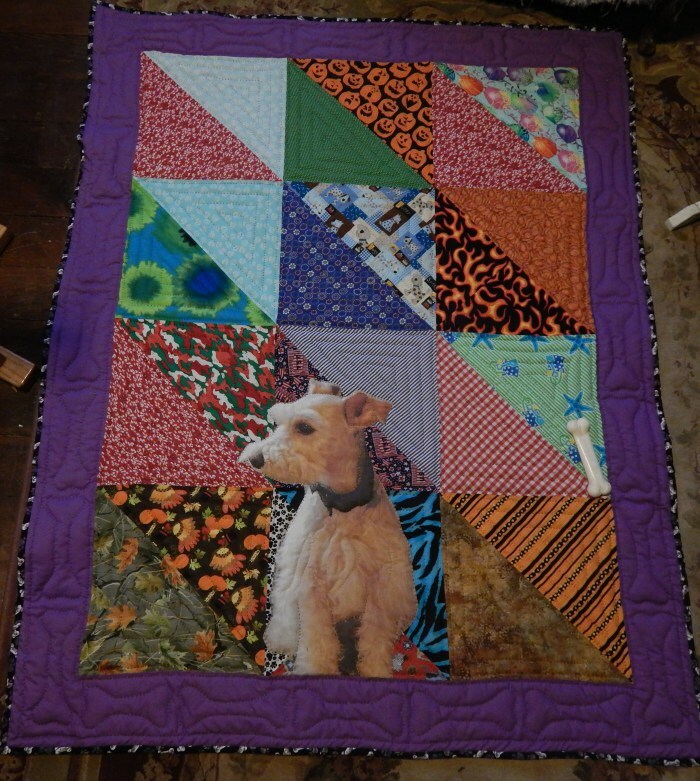 The quilt is made from the bandannas he gets when he goes to the groomer. I’m going to play with the new machine . 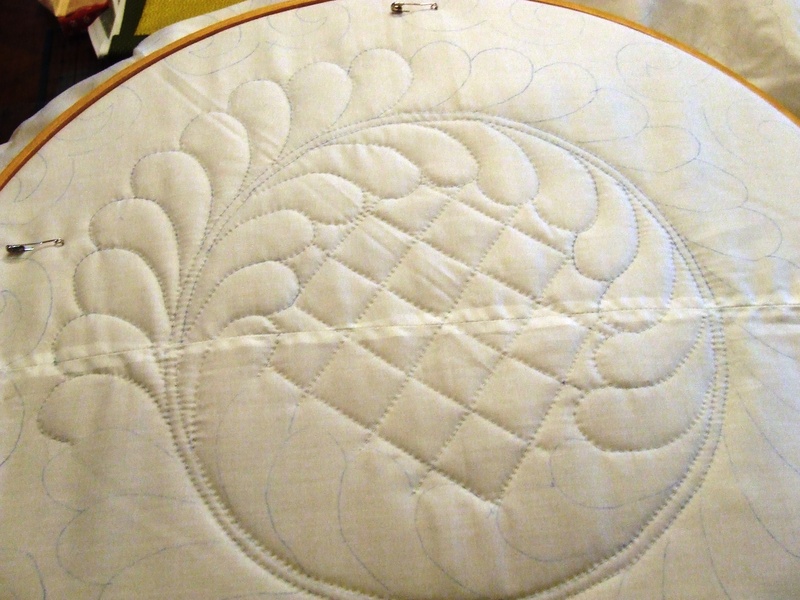 This entry was posted in ETC, Quilts and tagged Quilting, sewing, singer 600. I just used the fabrics that Teddy got from the groomer….she changes them seasonally and I never know what we will get……. Tim, congrats on your new machine. Now you have to give her a name. I was able to find out who owned mine and so her name is Audrey. My dog also gets bandanas. I never thought of making a quilt from them. You are SO creative! You snd Teddy have a good week. I got my mother’s machine this year and it looks just like that, further investigating, it is a Singer Touch & Sew model 626 and the copyright in the book says 1966! Nice stitches. Have fun with it! BTW, you can never have too many sewing machines! LOVE LOVE THE BANDANNA QUILT. I am so stealing that for my doggie. Good luck with the machine. I still have my Kenmore that is 36 years old and works like a charm. I am now down to 3 machines. Amen to that cost! I have 2 mini schnauzers. Max and Ruby. They are almost 14 years old. I think I put the groomers kids through college, lol. Never thought about saving the bandanas to use for a doggie quilt. Brilliant idea! they are expensive to keep, but the best dogs! have their own good qualities. 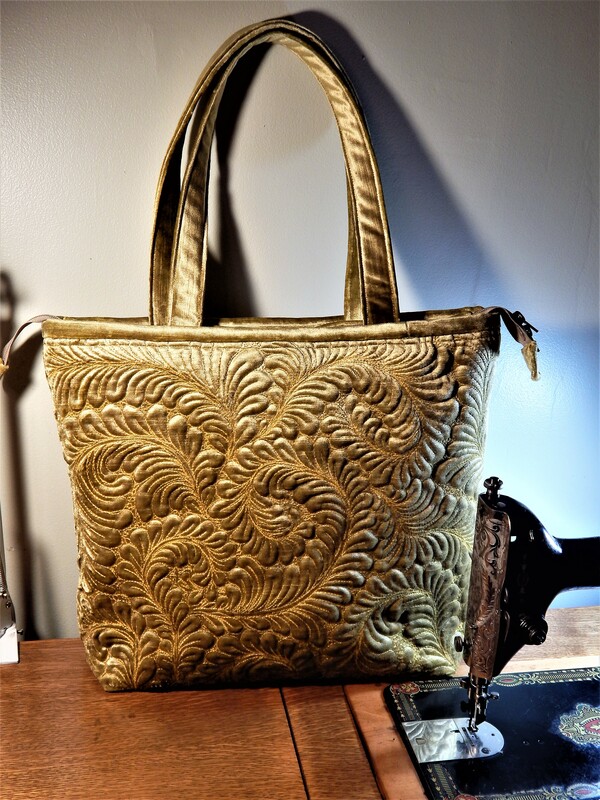 I sew on one like that, a 603e golden Touch & Sew. Love that machine. I traded it once, hated the new machine, went back the next day to undo the deal and get it back. Bought one just like yours for my daughter a couple years ago at Goodwill. Enjoy! Dinner is over and I think a trip to the sewing room is in order. Have been trying to get it in order…. way too much stuff and am a tad green over your whole house expansion! including yard. We are in our beautiful six weeks of weather so I will be out side pulling roots of invasive plants and putting the garden to bed. 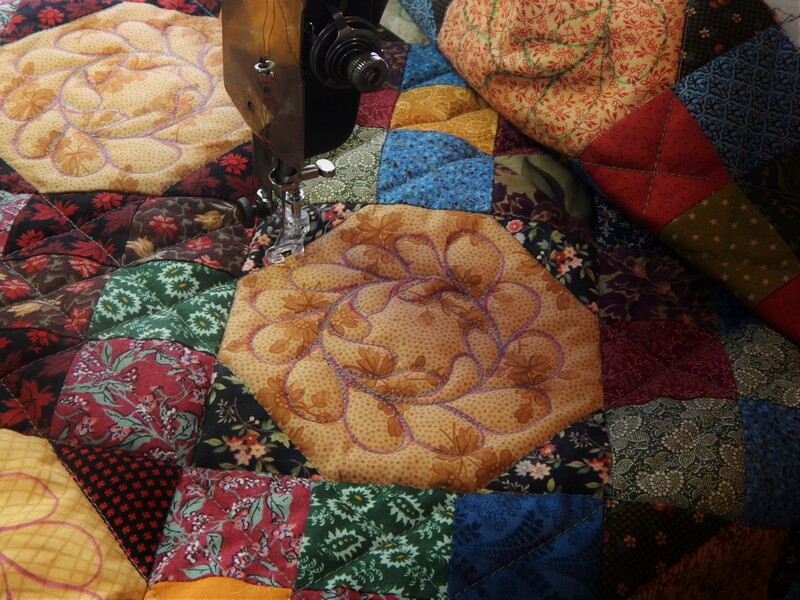 Funny how those extra machines come home….. enjoy your new toy and happy quilting or should we say piecing. What fun! Love the new sewing machine! I know everyone gets all excited about the new models with all their bells and whistles….but I will take my Featherweight above them all! Love that view out your window…fall is my favorite time of year….I do, however, enjoy looking at pictures of your gardens in the spring and summer! 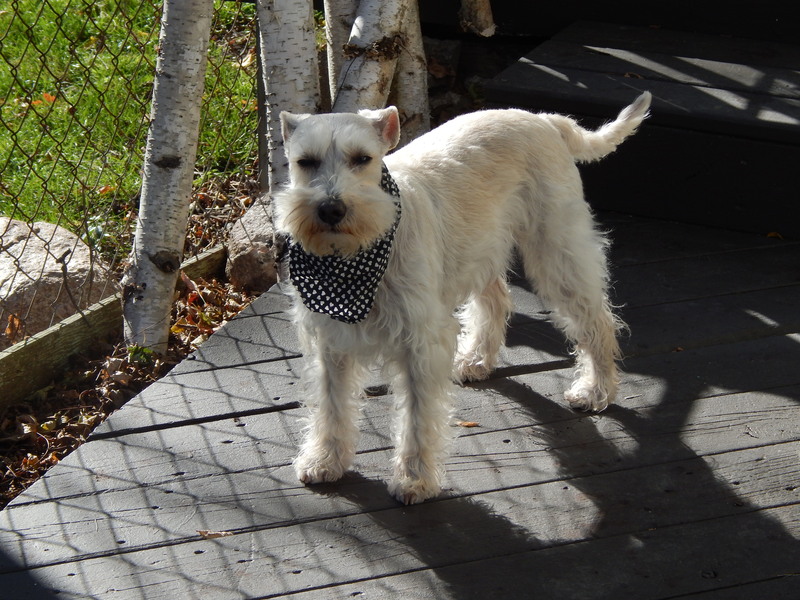 That Teddy is one busy boy….quilt inspector, and now patrolling for squirrels! 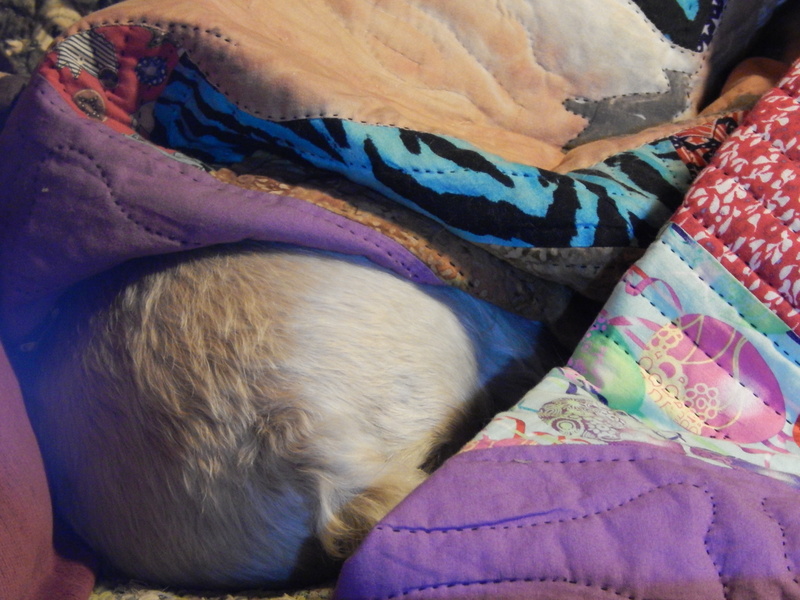 No wonder he is snuggling under his bandana quilt….it is great to see that quilt again! Tell him I said hello! I had that exact same machine plus cabinet and manual. I gifted it to my daughter a few years ago. Teddy looks like he means “business”! I bet he’s a real sweetie…..just love dogs😊. Whip something up with your new machine… I always look forward to your posts, Tim. Well Tim it was a fantastic year! And I also learnt to sew on that machine, my mum still has it but hers was converted to a treadle As we did not have electricity. Have lots of fun with it. My biggest regret I have was disposing of my old singer I bought in the 70’s. The machine I have now (not a singer) just is not the same quality and definitely not as reliable. 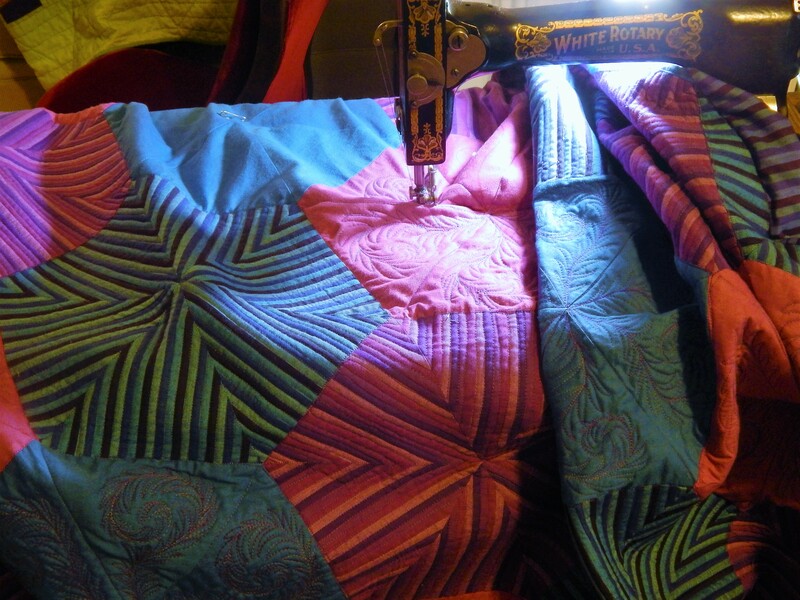 Recently I sent the cams and spare feet to a beginner quilter in an online quilt group who had inherited the exact same machine. So I feel all was not completely lost. It will be lovely to watch the trees turn – we are just hitting summer and I have my first serious burn or the season. In North Carolina this time of the year is AWESOME!!!!!! There is nowhere else in the world to me where fall is more beautiful. I don’t think there is a fall in this part of CA!!!!! The drought has been so long and hard the farmers all have harvested most the crops early. And it’s still hot near Sacramento. yes….a few flurries already….I have lots of fall garden clean up to do yet….and I want to get some bulbs planted before it freezes! My daughter restores old machines. The Touch and Sew is not well loved her her circles, while the 301 is VERY well loved. Looks just like the one we had in Home Economics in high school. Quite the sturdy machine. Love your creativity! I’m late to the party but I enjoyed this post because I learned to sew on a machine exactly like that one. I have it on display in my studio! I’m glad you found one, too.